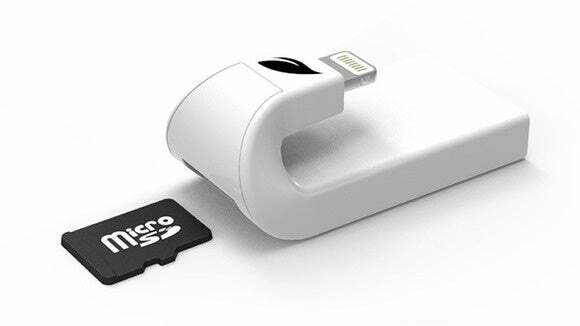 A hook-shaped plastic dongle that plugs into the Lightning port of an iOS device to provide expandable storage from microSD cards. iOS has come a long way over nine generations, but Apple still has yet to address one very large elephant in the room: Expandable storage. Cupertino insists on keeping the base model at a measly 16GB, so iPhone owners are the first to seek alternatives—and fortunately, third-party accessory makers are all-too-happy to fill the void. This tiny, hook-shaped Lightning dongle is all you need to access photos, videos, music, or documents stored on microSD from any iOS device. One of the latest is iAccess, a tiny dongle that plugs into the Lightning port of an iPhone, iPod touch, or iPad. At the base of the white plastic unit is a slot for a microSD card (sold separately), which can be inserted or removed with a thumbnail. The reader is compatible with cards up to 128GB in size; my older Kingston 8GB card worked great. The free MobileMemory app is the conduit between iAccess and your iOS device, allowing content to be viewed, transferred, or shared. Weighing only six grams, iAccess is angled in the shape of a hook, which gives the reader a low profile by extending only 16.6 mm from the device. The remaining 40.5mm wraps out of sight around back, leaving a 5 mm gap from the device—enough clearance for the bulkiest of cases. It’s a pretty ingenious design that solves a big problem with earlier card readers that stuck out like a sore thumb. The Lightning connector fits snugly enough that iAccess is unlikely to come loose even if accidentally bumped from underneath. I had no problem using iAccess on my iPhone 6s Plus or iPad Pro; older devices with 30-pin connectors are incompatible. iAccess is small enough to toss into a pocket or purse, but I’m surprised Leef didn’t build a keychain hole into the unit—it would keep the tiny gadget from getting lost, and make it easier to carry with you at all times. MobileMemory includes iBridge Camera, which allows iAccess owners to shoot video or take photos directly to the microSD card. Unfortunately, expandable storage is only half the battle: iAccess owners also need to download Leef’s free MobileMemory app to access or save content. 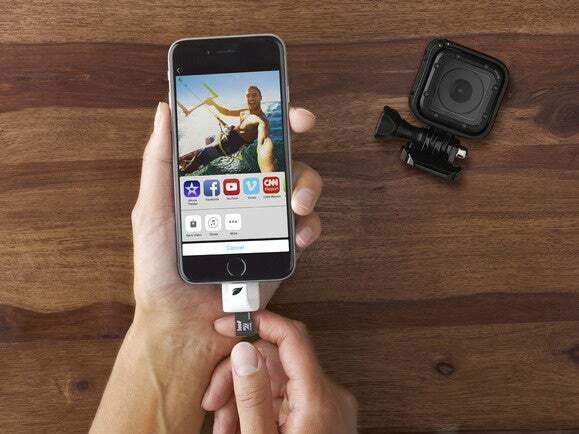 Although the microSD card can be used on Mac or PC with an adapter, Leef has positioned iAccess as an accessory for action cameras, and with good reason: Shooters can simply eject the card, slip it into iAccess, and instantly view, edit, or share from anywhere. 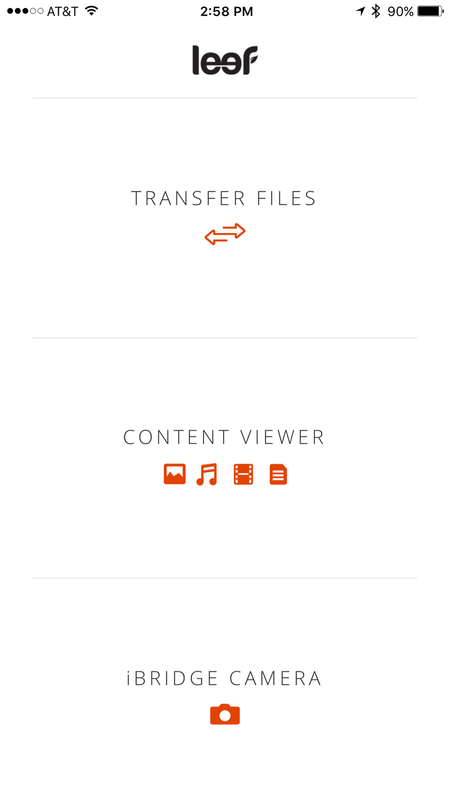 Once attached, iAccess prompts the user to open or install MobileMemory, presenting four different options: Transfer Files, Content Viewer, iBridge Camera, and Settings. 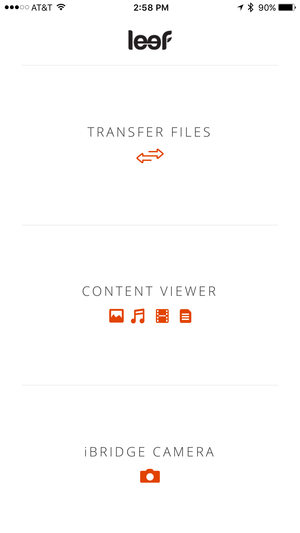 The first is used for transferring photos and videos to and from your device library, along with a file manager for sharing content with compatible apps. Content Viewer is used to view photos, music, movies, or documents, although it proved inconsistent with device videos—they usually show up under photos as well. iBridge Camera takes photos or videos directly onto the microSD card, quite handy for beleaguered 16GB iPhone owners. All in all, I found iAccess affordable and very handy. I liked being able to swap out microSD cards as needed, rather than being locked into a fixed capacity like other products, and the design is unique for this kind of product. Leef iAccess is a convenient way to expand the storage capacity of your iOS device—but it’s so tiny and easy to lose, you’ll wish there was a way to attach it to your keychain.